This section describes Adobe PDF Base-14 fonts in 5 font families: Helvetica, Times, Courier, Symbol, and ZapfDingbats. In the last tutorial, we learned that XSL-FO defines 5 generic font families: "serif", "sans-serif", "cursive", "fantasy", and "monospace". All XSL processors should support all of them. If your XSL-FO documents uses only these font families, you should not have any issues formatting them to any output devices. 4 font sets in the Helvetica family: normal, bold, and bold italic, with any size. XSL-FO "sans-serif" font family is normally mapped to "Helvetica". 4 font sets in the Times family: normal, bold, and bold italic, with any size XSL-FO "serif" font family is normally mapped to "Times". 4 font sets in the Courier family: normal, bold, and bold italic, with any size. XSL-FO "monospace" font family is normally mapped to "Courier". 1 font sets in the Symbol family: normal, with any size. "Symbol" is normally used for Greek alphabets and some symbols like: Ω, φ, ≠, ©. 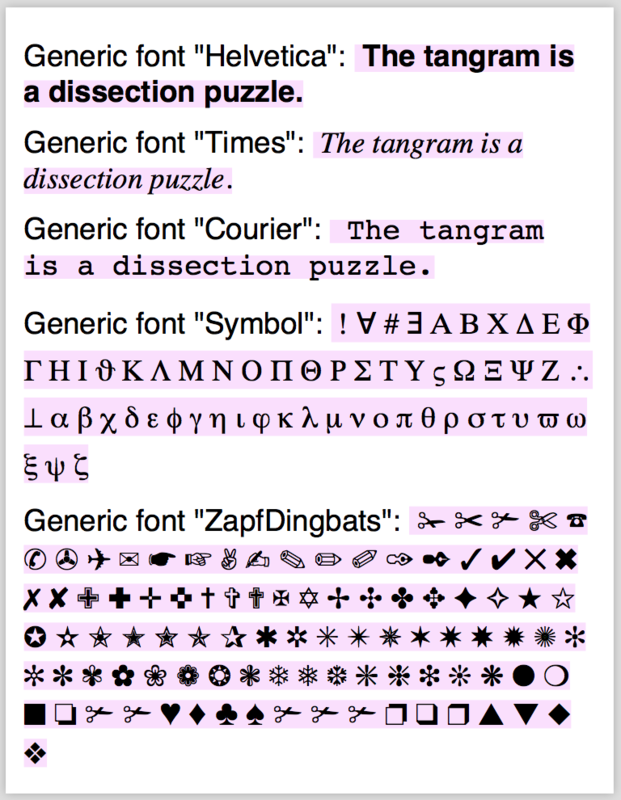 1 font sets in the ZapfDingbats family: normal, with any size. "ZapfDingbats" is normally used for Zapf dingbats like: ✌, ✍, ❀, ☺. The tangram is a dissection puzzle. Those warnings tell us that the Adobe ZapfDingbats font family does not support all dingbats listed in my XSL-FO document. Notice that Apache FOP replaced those 5 glyphs that are not supported in ZapfDingbats with "✃" near the bottom of the last block.